Can you believe how adorable these two are? Kate and I have different but complementary styles, and as soon as we started talking about the project, I knew it would be my Bruton Hoody that got a fresh look. Kate chose to scale down her popular Bluebells cardigan from the wonderful book, Yokes. She's kept the same pretty bluebell motif, from that point when the flowers start to go over and point skywards, but reworked the sweater to a more child-friendly cardigan. Sofia is wearing the age 2 size, and sizes are available from 1-12, but you should definitely check the actual finished sizes in comparison with your intended recipient - kids vary in size ENORMOUSLY! I had been of a mind to design a child's version of the Bruton Hoody since it was first conceived. As I worked on the original I had ideas about making a mini-version for my nephew James. Well, it's only taken a couple of years, but Wee Bruton is now here! The adult's hoody is worked in Excelana DK, but to keep the proportions of the Bavarian twisted stitch motif, I have scaled the Wee version down to Excelana 4ply. Both yarns are a joy to knit with, and there are some limited edition colours available in the 4ply at the moment, if you're quick! 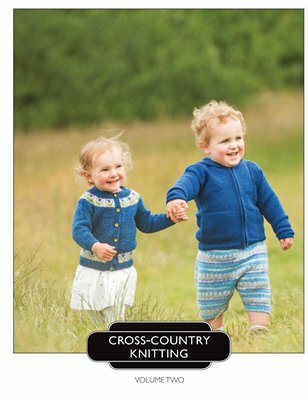 When you purchase Cross-Country Knitting Volume 2, you not only get the patterns for Wee Bruton and Wee Bluebells, but also a lovely essay by Rachel Atkinson exploring the significance of childhood handknits. Spoiler alert, there are pictures of Kate, Rachel and me as kids in handknits along with that article! It's a great read. Thanks for joining us on the CCK adventure Rachel! Kate and I were overjoyed when Fergus Ford (the brother of the TURBO Felix) agreed not only to photograph but also arranged our fantastic models for us. Fergus has really captured the exact look and feel we were hoping for in these beautiful pictures. If you'd like to know more about Kate's design, head over to her blog to read more.